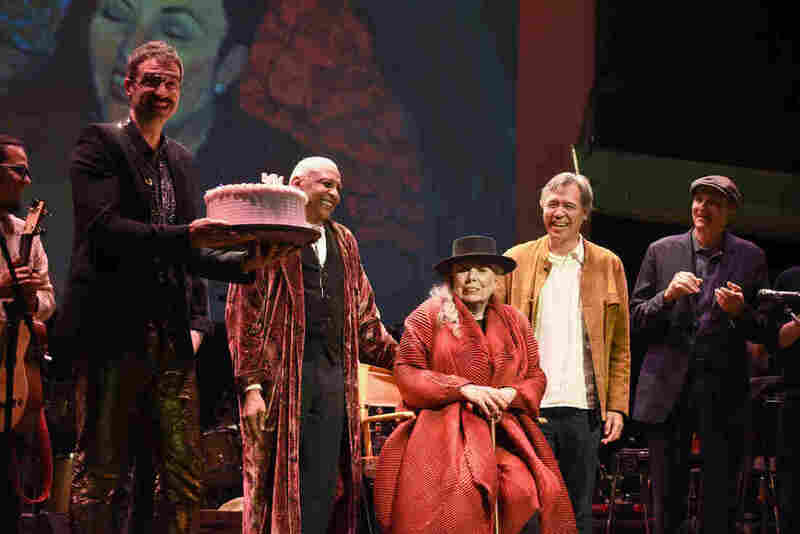 Joni Mitchell At 75: Trouble Is Still Her Muse At a concert in Los Angeles this week in honor of her 75th birthday, Joni Mitchell listened carefully as a hand-picked group of peers and protégés entered into a dialogue with her inexhaustible voice. 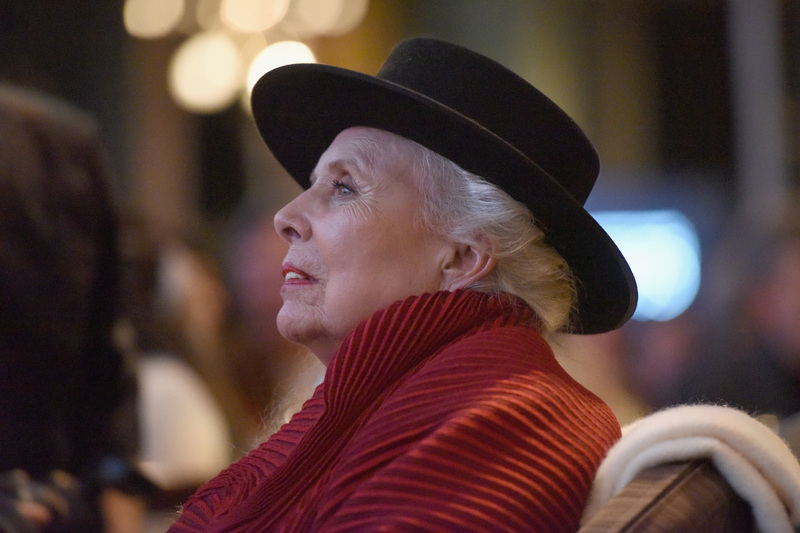 Joni Mitchell (seated) took the stage on Nov. 7 at the conclusion of Joni 75, a benefit performance in honor of her birthday. "I wouldn't have pursued music but for trouble," Joni Mitchell once said. Mitchell was referring to real problems — her childhood time spent bedridden with polio and the life-shaping loss she experienced after giving her daughter up for adoption in 1965. Those events solidified the drive that pushed Mitchell forward from small-potatoes rural Canada toward the American meccas where she would prove to be the magnet shifting the needle of pop. But trouble, in all its manifestations, is also Mitchell's muse. More than just a photo op, Mitchell's appearance at Joni 75 — a moment that was troubled, in the best way — reflected the entire endeavor. As a fly on the wall at rehearsals for Joni 75, I watched the stars who participated overcome their own shivers as they took on songs that demanded they deploy their best resources. Here were old friends and collaborators, including Graham Nash, Chaka Khan, Kris Kristofferson and James Taylor, and more recent protégés, from Seal to Diana Krall. These were people who had recorded with Mitchell, hung out at her house or even lived with her. They've won awards for covering her songs and sung them every night on their own tours. There were also a few less closely associated acts who nonetheless had been carefully chosen. One of the highlights of the program was the collaboration between East LA's greatest band, Los Lobos, and leading younger Latinx music lights La Marisoul, Cesar Castro and Xochi Flores, on Mitchell's percussive masterpiece "Dreamland." The original recording featured a percussion circle that included percussion greats Airto Moreira, from Brazil, and Manolo Badrena, from Puerto Rico. Khan, who sang on the original "Dreamland," added Latinized jazz vocal lines. By taking that song to the California-Mexico border, this ensemble renewed it for a new century — and connected it to a different kind of trouble, one that music seeks to overcome, at least symbolically, with joy. I watched other cast members deconstruct classics and stitch them back together with thread they'd taken from Mitchell's own closet. Taylor, for example, found a way to do "Woodstock" that honored both the propulsion of the hit Crosby, Stills, Nash & Young version and the delicacy of Mitchell's own recording. Krall, for whom Mitchell's music was a bridge from straight jazz to the more eclectic music that made her famous, played the close reader on "Amelia" and "For the Roses," her interactions with bassist Christopher Thomas suggesting thorny conversations she's had with herself about these songs for years. Artists like Krall have thought hard about how Mitchell's work is not exactly like their own, and how they could take on the challenge she poses without getting lost in imitation. Mitchell's music is a problem they have to solve, not only because of those tricky tunings and her verses crammed with cascading syllables. Most songs, even great ones, eventually land in one place: They may flirt with irresolution, but in the end a major chord or a cleanly turned cliché resolves it all. Not Mitchell's songs. As she wrote in "A Strange Boy," which Seal performed with steely conviction, Mitchell's music weaves a course of grace and havoc, as does life itself. Staying with it demands clarity. Mitchell, of course, also understands this playfulness. If I must indulge in the tradition of critics quoting her songs as a way of describing them — because none of us are as incisive as she can be — let it be here: Laughing and crying, she knows, it's the same release. As Mitchell's music becomes repertoire, it continues to challenge listeners to make room in their hearts for more than one feeling at once. In 2018, there can never be enough reminders that human experience is only enriched by self-reflection; by listening, quiet and solitude. Returning to Mitchell's songs now offers that precious gift: It reminds us that art comes not just from unexpected encounters — between people, cultures, the past and the present and the world of dreams — but from nurturing, from practice and the willingness to simply take time to make the work better. Joni Mitchell took that time. She faced down the trouble that simply living inevitably raises: the heart breaking, mending and scarring as time goes by; the soul shedding layers in the slow and sometimes untrustworthy process of enlightenment. Now we can see her as someone who, like all of us, lives with imperfection. It's something she always acknowledged in her songs, despite or maybe because of her overwhelming aura of mastery. Trouble was a teacher for her, though not a gift. Would that we all could find the power in knowing that.